“Effective engineering leadership is being outcome-oriented,” says Kickstarter’s Mark Wunsch. When Mark first joined Kickstarter as VP of Engineering, one of his first decisions was to re-organize the engineering department, based on business-oriented objectives. The engineers’ perspective, however, was difficult to communicate with leadership. Mark decided to use metrics to further align engineering and leadership. Seeing a low Pull Requests/Merged at the end of the week can be a red flag a team was stuck. 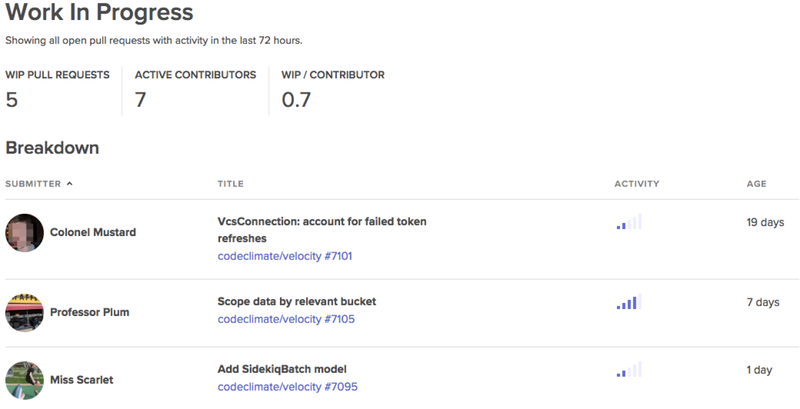 Unlike subjective measures that are common on most engineering teams, like story points completed, Velocity metrics are represented by a concrete unit of work: the Pull Request. This enables Mark to objectively understand when a scrum team is really bogged down, compared to the last sprint or last month. An example of Velocity’s Work In Progress which shows the old and active PRs that may be holding up the team. Because trickier parts of the applications tend to require more substantial changes, pull requests that are most “active” often point Mark to the most troublesome areas of the codebase. Learn exactly how technical debt is slowing down your team. After a few weeks of investigation, Mark was able to find concrete evidence for what his intuition was telling him. “The data showed that we were consistently slowed down because of legacy code,” said Mark. During meetings with the executive team, Mark could now point to weeks with less output and prove that technical debt was impeding the engineering team from their primary business objective: continuously delivering new features. 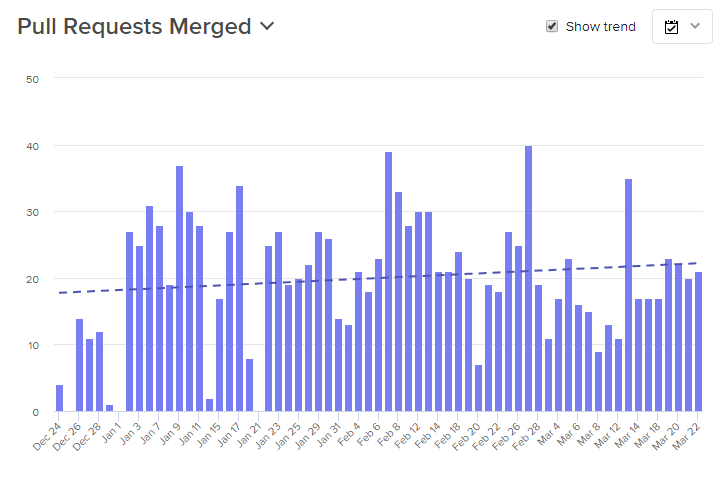 A Velocity report showing Pull Requests Merged/Day, over the last 3 months. This helped leadership visualize how much Kickstarter was growing in their engineering efficiency but also opportunities for further improvement. A Velocity report that shows the fluctuation of Cycle time, over the last 3 months. Cycle time was a great indicator of how much trouble it was to make a change to the codebase. High cycle time would often correspond to low output a day or two later, showing that some form of obstruction existed for a developer or team. These two charts, along with Mark’s summary of his more technical findings, aligned all of leadership around scaling back on new features temporarily and dedicate more time to refactoring. After spending time investigating what legacy code was slowing down the team, Mark was able to take a strategic approach to how they tackled technical debt. Rather than jump on the opportunity to fix anything that looked broken, he could have teams focus on the biggest productivity blockers first. Engineers were happy because they had the time to rework the legacy code that was constantly slowing them down. Leadership was happy when they could see long-term improvements in engineering speed. Six months after refactoring, Kickstarter saw a 17% increase in Pull Requests merged and a 63% decrease in Cycle Time. It was a win-win-win. If you want to learn exactly how much technical debt is slowing down your own engineering team, try Velocity free for 14 days.